1) Estimate the number of cones needed; and Calculate the cost of the thread needed to manufacture the finished product. Thread consumption can be determined in several ways. Measure the actual amount of thread consumed in a specific length of seam. Calculate the thread consumption by using mathematical stitch formulas based on the thickness of the seam and the number of stitches per inch. Calculate the thread consumption using thread consumption estimates. A specified length of the seam, for example 3 inches, is measured on the seam and then the thread is removed by carefully unraveling the stitch. You can then calculate the amount of thread consumed in one inch and multiply this factor times the total length of the seam measured in inches. Length of seam is 42 inches or 1.17 yards. Stitch and seam construction: 401 SSa-1. Specified length of thread removed from a seam equals 3 inches. Needle thread factor = 9 ¸ 3 = 3 inches of needle thread per inch of seam. Looper thread factor = 8 ¸ 3 = 2.67 inches of looper thread per inch of seam. Total Thread = 3.51 + 3.12 = 6.63 yards per seam. Generally, a 15 to 20% waste factor is added due to chaining-off, thread breaks,repairs, etc. If a waste factor of 15% is selected then: 6.63 yards/seam X 1.15 = 7.62 yards/seam including 15% waste factor. Obviously, you must do this for each seam to determine the total amount of thread consumed in the finished product. Union Special Machine Company published a "Thread Consumption Booklet" that consists of a number of thread consumption formulas for various stitch types based on the stitch length and thickness of the seam. 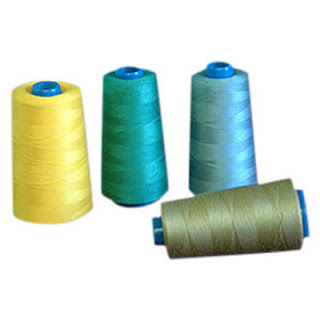 These mathematically derived consumption factors can be multiplied times the length of the seam to estimate the combined amount of top and bottom thread. On some overedge and coverstitch types it is necessary to also know the seam width or needle spacing to properly calculate the amount of thread consumed. Length of the seam: 42 inches or 1.17 yds. 1.17 yds X 5.20 = 6.08 yds / seam. 6.08 yds/seam X 1.15 = 7.00 yds per seam including a 15% waste factor. As you can see from the Union Special chart, the more stitches per inch and the thickness of the seam impacts the amount of thread consumed. However, most heavy fabrics are sewn with fewer stitches per inch and most light fabrics are sewn with more stitches per inch. Therefore we have come up with the following estimates based on typical seam thickness and stitch length. fabrics or long stitch lengths. needle thread will change based on the thickness of the seam. and H. Wt. (heavy weight) is generally like denim applications. The following is a list of sewn products and thread consumption totals based on thread consumption reports conducted by our Technical Service Department. These thread consumption figures include a 25% waste factor and are based on a typical garment construction. Men’s Dress Shirt thread consumption with 25% waste factor = 131 yds. Average Cost of T-24 Poly Wrapped Core Thread = $4.50 / 6000 yard cone.